Hello dear readers. Happy Memorial Day everyone. God Bless those that have served our country in the past and have fought and died for our freedom and those that are currently serving in the military. Thank you all for your service. Most all of my draft posts start out with an apology for being absent for so long so I won't start this one that way. I'm always stitching, so I thought I would show you some of the things that I've been working on lately. This is my progress so far on Sue Daley's Rose of Kaleigh sew along. Sue gives us a few steps to sew each week. I believe the sew along is on week 13. I have finally caught up and have done the center and some extra single hexagons. I laid it all out on the floor to take a photo so I can get a good idea of what the finished quilt might look like. 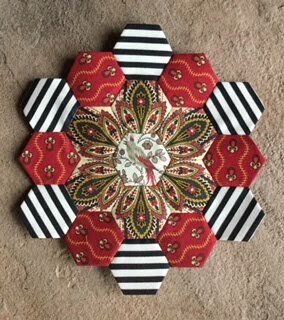 This is another block for my double hexagon quilt that I talked about in my last post. I am using some leftover 1" hexagons that I have basted to make these blocks. These blocks are really a lot of fun to put together. 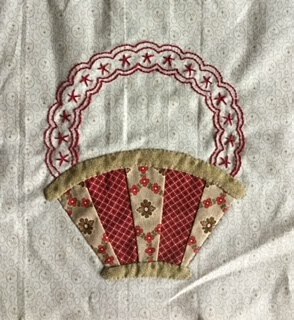 This is one of the baskets from the Antique Basket pattern I've been working on. The baskets are cut from a template included in the pattern. I've prepped all of the basket bottoms and needle turn appliqued the top and bottoms onto the baskets. Now I am embroidering the handles on the baskets using a product called Transfer EZE. You put the Transfer EZE sheets in your printer, copy the outlines, and stick it onto your background. It is fairly thin so you embroider right through it. Then when you are finished with the embroidery, you soak the block in water and the Transfer EZE comes off. 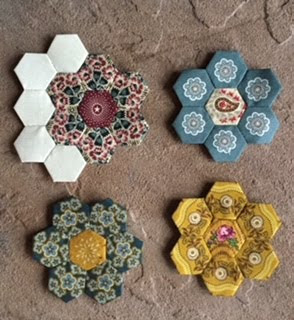 Here are 4 more 3/4" hexagons for my Libby Morgan Reunion quilt that I talked about in my last post. I will start putting the quilt top together soon. 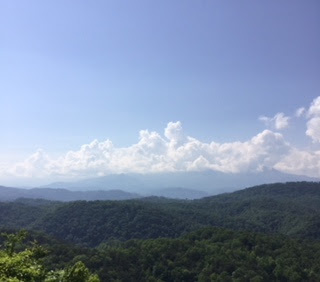 We are on vacation in the mountains for a few more days. We've been here about 10 days. I've been to 4 different quilt shops while I've been here. Nope. I didn't think to take one single photo. It's rained just a little nearly every day and most times there has been a rainbow. We also stopped and took a tour of the Buffalo Trace Distillery in Frankfort, Kentucky. The little buffalo on top of these bottles are collector items. This is the room where they bottle the bourbon and put the labels on the bottles. This is our tour guide getting ready to pour the samples.